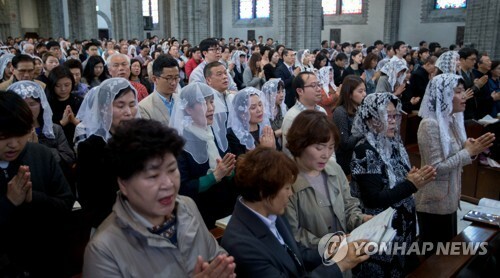 SEOUL, June 8 (Yonhap) — South Korea’s population of baptized Catholics reached about 5.6 million, the world’s 43rd largest, in 2015, the local church said Thursday. According to the official statistics released by the Catholic Bishops’ Conference of Korea based on the 2017 Vatican yearbook, 5.592 million South Koreans were baptized Catholics as of the end of 2015. The figure was about 1 percent up from 5.5 million in the previous year. The population rose steadily from 5.22 million in 2011 to 5.31 million in 2013 and 5.39 million in 2013. There was a relatively large 5 percent growth in the number in 2014 when Pope Francis made his first-ever visit to the country, the conference said. South Korea’s Catholic population was the fifth largest in Asia after the Philippines (83.615 million), India (21.365 million), Indonesia (8.137 million) and Vietnam (6.754 million). Meanwhile, the world’s Catholic population grew 1 percent to 1.285 billion in 2015 to account for 17.7 percent of the world’s population.